We got a bit of a surprise today with 2" of snow falling for the morning commute. The forecast of sun and 50F later today is poor consolation. For those of us with severe cabin fever, this type of storm is just the (final?) icing on what's been a long winter. It's gotten bad enough that yesterday I got outside for some fly casting practice. Even with a light mist and 45F temps it felt good to stretch my arm and refresh muscle memory. 2fly moved into the rigging shop late last week. 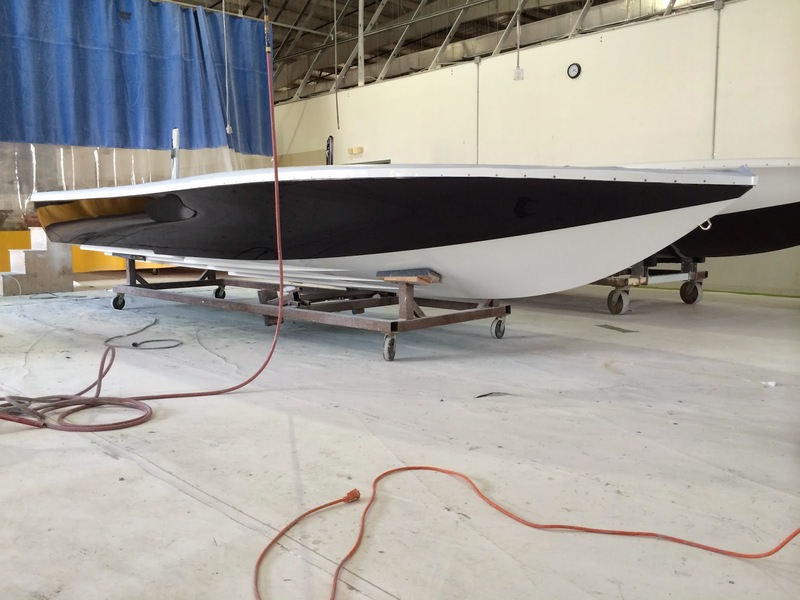 The crew at Yellowfin sent a few more photos so I can at least vicariously enjoy the process. The center console is partially rigged. You can see the interior of the rod tubes where drains will be installed to route any drips or splashes down into the bilge. The cutout for the glove box is the gray oval. Toward the very top is the back of the Simrad NSS8 that we are installing until the new evo2 units are released. Two speakers are mounted here, and there will be two more in the gunnels even with the leaning post seat. A favorite feature of mine-- the cup holder/rod holder combination that is nearest in the photo. The dash layout is coming together. Steering column is mounted, and the shift and throttle control in the center of the dash. Above that is the trim tab control. The glove box hole is more clear here. In the center of the dash is the NSS8 plotter. That will be replaced by the NSS12 evo2 shortly. To the right in the white space will go the NSS7 evo2, with the VHF below that. Left of the plotter is the Mercury VesselView 7 system for engine performance monitoring. The Bob's jack plate has been installed and the rest of the rigging is under way. Here's the clutter of a boat in progress in full display. The rod holder hatches are on the stand next to the boat. On a cold winter's day, seeing these is incredibly uplifting. Two weeks to go. 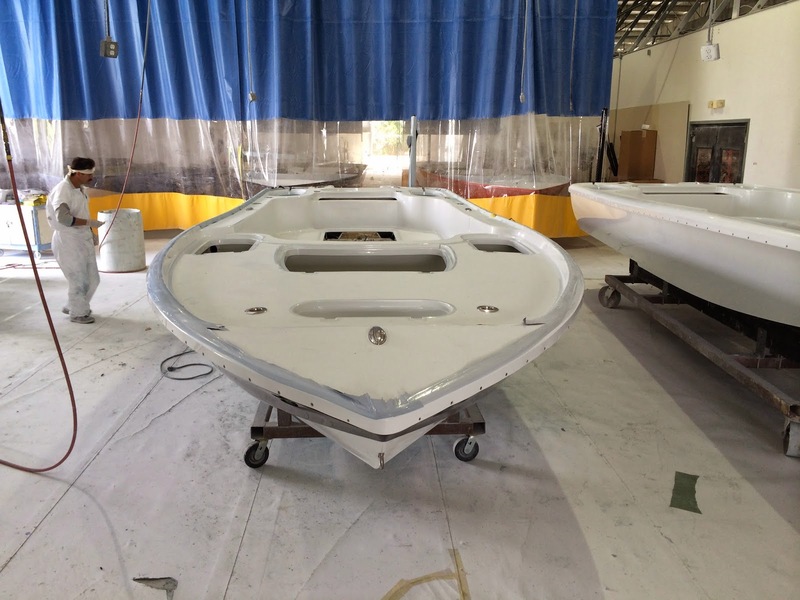 2Fly is in the finishing shop, where the do the final sanding and polishing of the fiberglass. From here it goes to the rigging shop, where they install the engine, electrical, console and electronics. We've experienced a minor hiccup on the electronics package we're installing. We ordered a pair of next generation Simrad NSS evo2 multifunction displays. This is a brand new unit, and unfortunately Simrad missed the originally announced launch date. Simrad is giving us a loaner of the prior version (NSS8) to install for a couple months until the units we ordered is available. Then we'll enlarge the hole and drop in the new NSS12 evo2. I'm part annoyed that the boat isn't perfect out of the gate, but mostly happy they're giving me a solution. Most important, it won't affect our build schedule. Yellowfin is running full speed, but in spite of how busy they are they managed to get me a few photos. Starboard quarter view. Powerpole is on and towing rings. The majestic blue hull is in full view. The rub rail has yet to be installed. From the stern. The livewells with their 'ice blue' interior are visible. You can see the two rod holders on each gunnel aft of the spring cleats. There are another two rod holders just inboard of the side livewells. You can see the fuel tank pretty clearly here, too. Starboard bow shot. Two tone hull. If you look carefully, you can see the step in the hull. Yellowfin manages to give even their bay boats a bit of flare in the bow, which I think is beautiful. Head-on shot. Not much here but the bow cleat and the two rod holders mounted on either side of the anchor compartment. They are fabricating a casting rail that will fit into those rod holders, too. 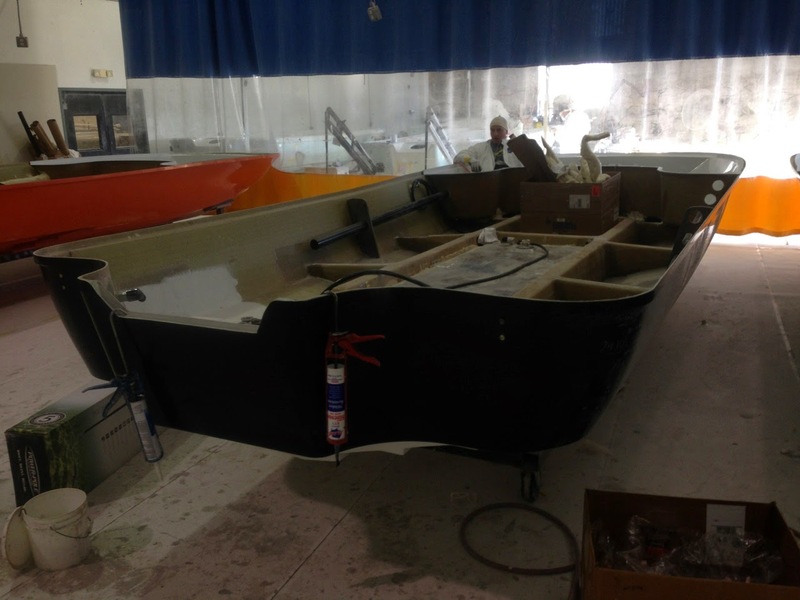 From finishing, the boat will move into the rigging shop. 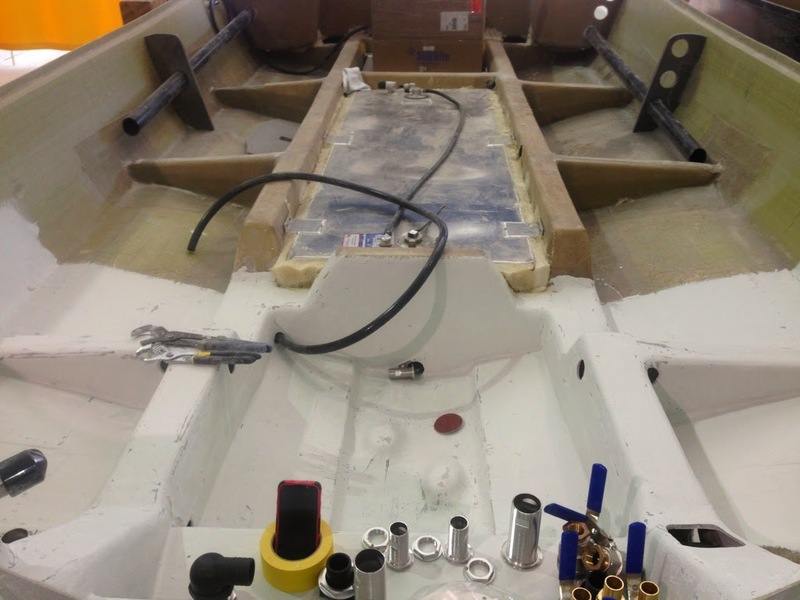 There they plumb livewells, install the motors and put the other systems into the boat. Elsewhere, the electronics will be installed into the center console. The console and the leaning post get installed shortly after. Many months of waiting and planning have past. 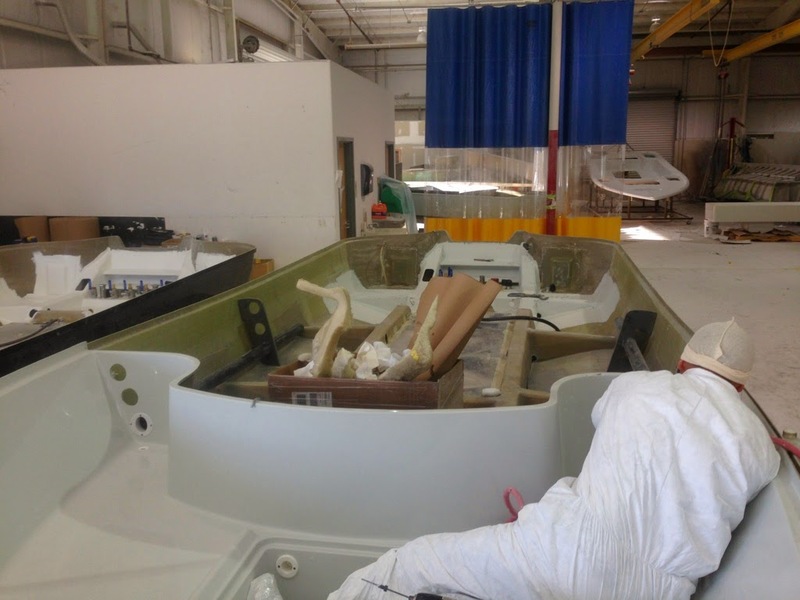 In February I visited Yellowfin to finalize the build sheet. 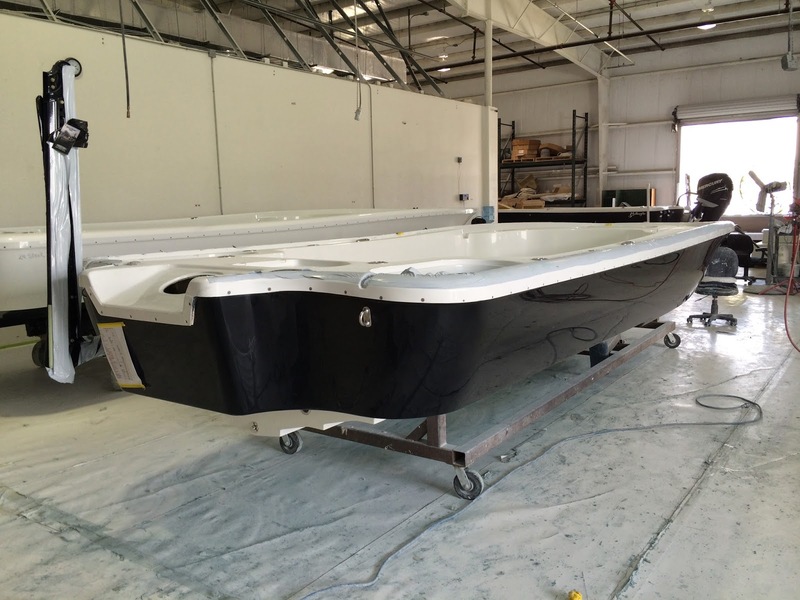 Shortly after that, our Yellowfin 24 Bay went into the mold and 2fly was born. Yellowfin is very good at keeping the customer engaged throughout the process. 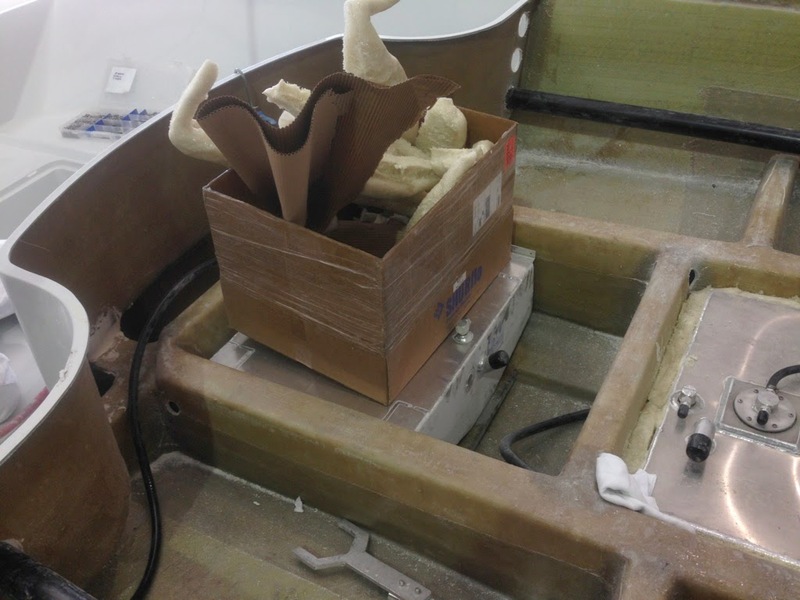 They provided me with some photos of the boat shortly after she came out of the mold. Shot #1 is taken from the bow. The guy working on the boat is sitting inside the bow storage compartment. 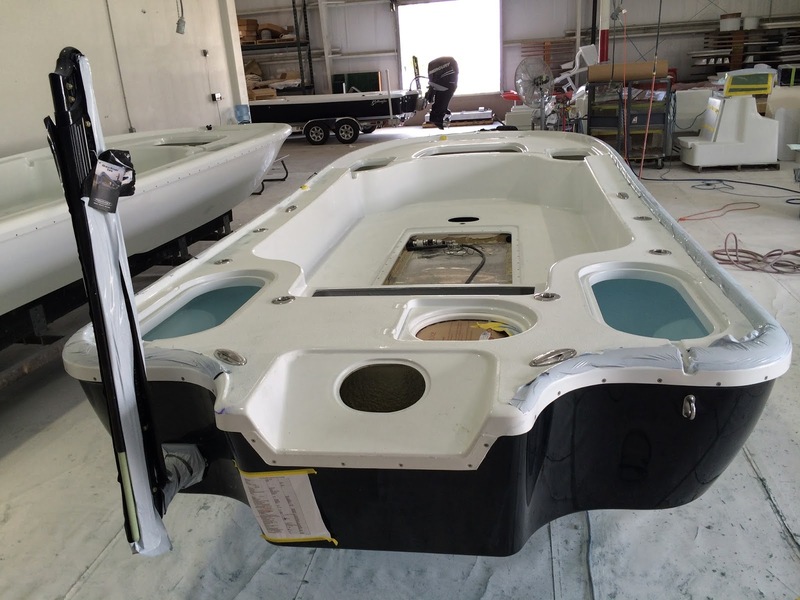 On the left side of the hull you can see the where the three rod tubes will be installed. He's installing a tube on the right. His feet are down inside the trolling motor battery compartment. A bank of three batteries sits down there-- out of the way and low center of gravity. You can see some of the stringer system in the hull. Interior of the storage compartment is a very light gray. Also of interest, the hull next to mine on the left shows the seacocks and through hulls in the stern for the livewell plumbing. In the background you can see the deck of a 24 waiting for installation. Could be mine? Shot #2 is centered on what will be the sole of the cockpit just in front of the leaning post. On the left is the bow storage area. Top you can see one of the rod tubes. The stringer in this area is fully visible. There are two aluminum tanks. The one of the left (forward) is the freshwater tank. The one on the right is fuel. You can see how they foam the fuel tank in. If I recall the fresh water capacity is 17 gallons, and fuel is 77. Shot #4 shows the hull. Not a great photo, but it's blue! You can just see a bit of white peaking out at the stern where the engine bracket overhangs the running surface. You can see how they move the boats around on dollys. Sitting on the ground is the Power Pole, still in box. It's very excited to see the boat coming together. The build process makes the anticipation even greater. The closer we get to delivery, the longer the remaining wait seems. Time compresses and shifts. All in the buildup to our delivery in April and the spring run of striped bass.